Romuald Hazoumè, who is of Yoruba origin, grew up in a Catholic family, but remained in contact with the Vodun society of his forbears; this dual cultural heritage finds expression in both his masks and installations. 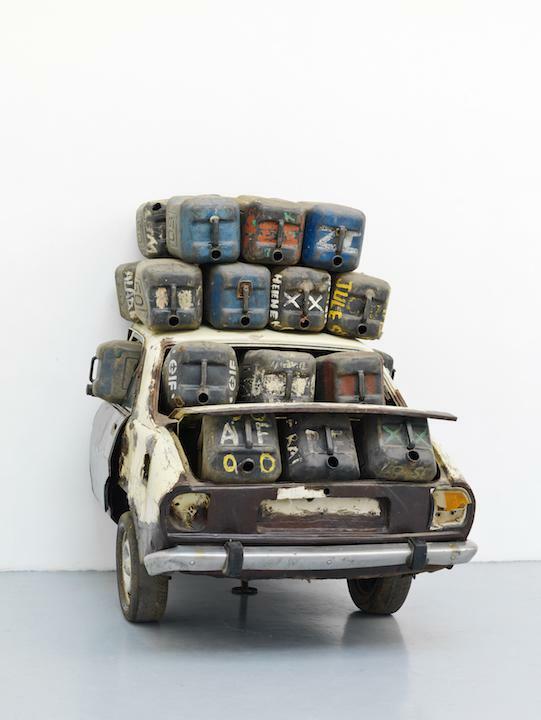 In the mid-1980s, he began an extended series of works made from discarded plastic containers, and in particular from gasoline canisters. After slight modifications, these objects became masks, which subtly reveal Hazoumè's critical vision of political systems. He has said of his work: "I send back to the West that which belongs to them, that is to say, the refuse of consumer society that invades us every day." Hazoumè's masks conform more to the recovery of their materials than to Yoruba traditions; however, there are also important links with this heritage. Hazoumè's art suggests a parallel reading and illustrates how the artist draws on the vocabulary of the initiated to give character to his creations. His art is immediate, but also complex and profound, dealing with political and sociological issues, and questions of identity, as well as pure aesthetics. It is new and contemporary yet embedded in tradition. It is serious but also ironic and full of wit. One can see his work as inevitably coming from West Africa, dealing as it does with survival among other things, but it is assertive and sure of itself. Indeed, his work can be understood as a modern reinterpretation of the phenomena of trances, revealing without reserve the madness of current events. Hazoumé belongs to a second generation of African artists who have obtained well-deserved international recognition.